Trevor Corson hosted a series of historical sushi dinners for about six years, based mainly in New York City. The dinners received wide media coverage and educated attendees on the gastronomic and ecological benefits of traditional sustainable seafood. Trevor Corson's book The Story of Sushi: An Unlikely Saga of Raw Fish and Rice was partly born out of concern with an ecological disaster in the making. The factory fishing and fish-farming industries, along with global seafood distributors and international Asian restaurant operations, profit from invented stereotypes about Japanese cultural purity in their worldwide marketing of sushi. The result? Without intending to, sushi lovers contribute to the decimation of global fish stocks in a way that departs from sushi-making practices of the past. At the same time sushi lovers are also risking their own health. All this is particularly true in the case of bluefin tuna. Trevor's work has emphasized a more unexpected history of miscegenation. Sushi is really a cross-cultural and environmentally-aware hybrid. The folkways of sushi-making, and the diversity of techniques and ingredients in traditional sushi, show us how to eat in ways that are more sustainable and more healthful. When The Story of Sushi was published Trevor drew attention to these issues in an op-ed in The New York Times. After The Story of Sushi was named a Best Food Book of the Year by Zagat and The Best American Food Book of the Year by the Gourmand Awards, Trevor began hosting a series of guided historical sushi dinners, primarily at the Michelin-starred Jewel Bako restaurant in New York City. Drawing on his extensive Japanese-language research into the history of Japan's cuisine, Trevor collaborated closely with traditionally-trained Japanese master chefs. Together they designed menus representing a more diverse style of sushi, truer to the roots of the cuisine as it was probably eaten a century ago. At each meal Trevor guided his guests through the menu, weaving anecdotes from his research together with real-time tips on how to appreciate the skills of a old-fashioned sushi chef, in the process revealing secrets of sushi history, craft, appreciation, and etiquette that often came as a surprise even to seasoned sushi aficionados. Although Trevor's dinner series has concluded, sushi enthusiasts can still delve into a copy The Story of Sushi and then, armed with the information from the book, pursue a more interesting and sustainable sushi experience themselves—a lifelong adventure. Thankfully, this adventure is getting easier to pursue, as a small but growing number of sustainable sushi restaurants has begun to appear around the United States. See if one exists near your location; these establishments are trying to help preserve sushi and our oceans for the future, and they deserve our business. 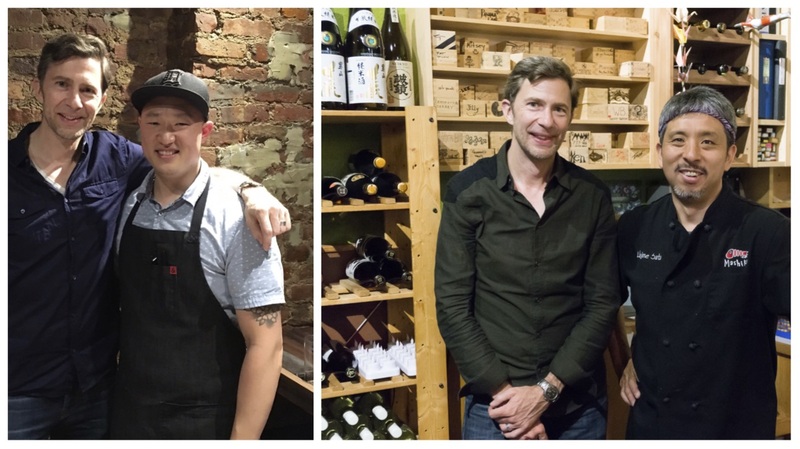 Two of Trevor's favorite sustainable sushi bars he's visited recently are Mayanoki in New York City and Chef Hajime Sato's Mashiko in Seattle—give them a try! Trevor Corson with Chef Mike Han formerly of Mayanoki in New York City (left) and Hajime Sato of Mashiko in Seattle (right). Trevor is also a fan of the southern American sushi chef Marisa Baggett, whose prolific work in the Memphis area emphasizes local ingredients and vegetarian sushi options as alternatives to industrially over-harvested sushi fish. If you're interested in trying to make your own sushi at home that's more sustainable, check out Marisa's cookbooks Sushi Secrets, to which Trevor wrote the foreword, and her sequel, Vegetarian Sushi Secrets. To learn more about Marisa and other non-traditional sushi chefs, read Trevor's article "American Sushi" in The Atlantic. 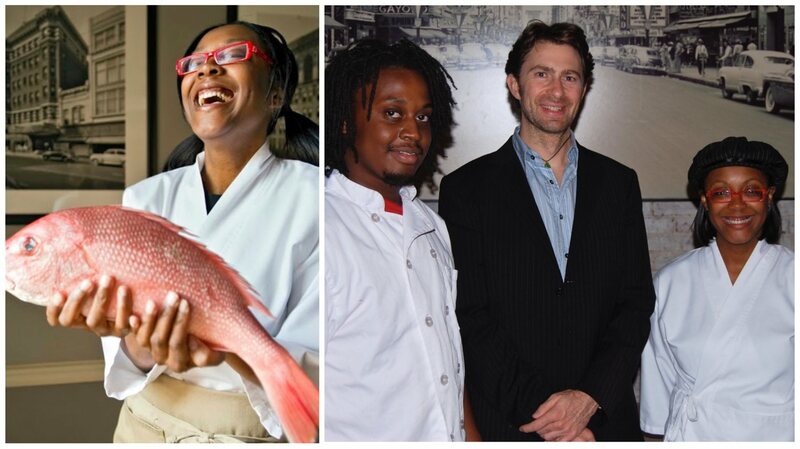 Southern sushi chef Marisa Baggett (left), and (right) with Trevor and an apprentice chef in Memphis. Trevor Corson is an East Asia scholar turned popular nonfiction writer and author of the 2007 book The Story of Sushi, and for select groups he will act as a "sushi concierge," hosting dinners often at the Jewel Bako Japanese restaurant in Manhattan’s East Village, one of which I attended this past winter. A Corson-guided meal aims to reveal the historical truth of tuna and to represent the very different fish that were the staples of sushi in earlier times. Plate by plate I watched as Corson walked a group of Manhattan professionals through a traditional Edo-period meal. Trevor's historical sushi dinners have also been featured on Japanese national television and in The New York Times Dining & Wine section, The Washington Post, Food & Wine, Time Out New York, Tasting Table, Washington City Paper, United Airlines Hemispheres magazine, Plate Magazine, and other publications. 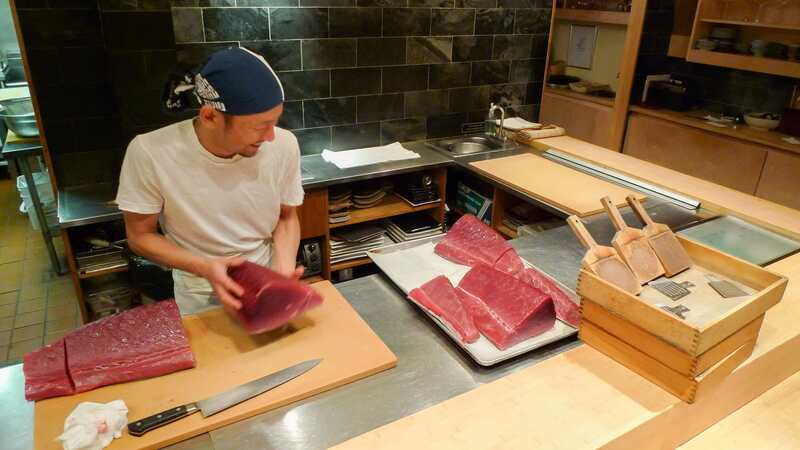 "Although we’ve eaten some great sushi in Tokyo and California, and even visited the Tsukiji Fish Market, our evening with Trevor was an excellent treat. He’s a great host, and learning by eating is a great way to learn! Our sushi meals will be much more fun the next time we're in Japan." “Trevor Corson’s sushi dinner for my colleagues and me was truly memorable, and made me realize that to find real balance in life, I really need to have a good wife, friend, priest—and sushi chef!"